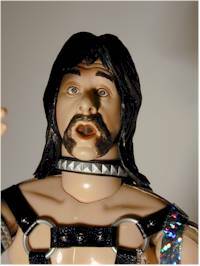 This is Spinal Tap iss a classic cult film from 1984. This 'mockumentary' covered the backstage lives of the famous band, Spinal Tap, and started what has become a standard style of comedy film making. Fans of rock and roll loved the film and the lampooning it gave the industry. 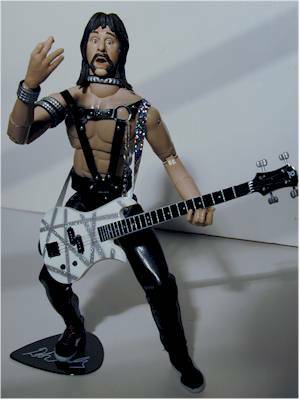 When Sideshow Toy announced that they would be doing 12" figures of the band, plenty of folks were surprised, since it's not a license you might expect. But these made it out this year, and have been selling at comic shops and music related stores such as Media Play and Sam Goody. I picked this set up from Hot Topic in our local mall. These sold originally for $30 each, similar to other 12" figures in their class. But I couldn't pass them up at $6.97 each! Check out your local Hot Topic, and perhaps the sale will be at other stores as well. 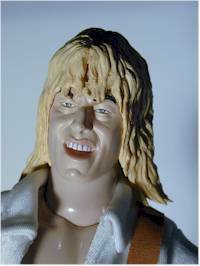 2015 Update: It's shocking enough that Sideshow figures were just $30 and sold at mass market retailers only 14 years ago. On sale for seven bucks? Wow. During the late 90's and early 00's, a lot of unusual licenses were produced. Everything from Monty Python to Saturday Night Live had figures, and since then many of them have been revisited in one format or scale. 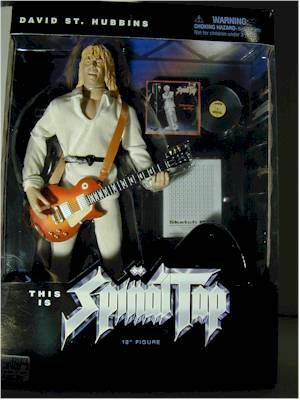 But this was the one and only time Spinal Tap has gotten the plastic treatment, at least that I know of. If you're waiting for Hot Toys or ThreeZero to pick up the license, you might be in for an even longer wait. Oddly enough, they don't go for much on ebay these days either. You can snag most of these guys still MIB for $30 or so, $50 tops. I've even seen auctions end in the $20 range...perhaps modern companies are smart not going after these again. I'm surprised there's that little demand, since the costumes and accessories aren't bad, and a decent repaint would make the portraits work well enough. Pop it all on a new body, and you'd have solid representations. I upped the size of the photos with this updated, but that means they get a little more fuzzy as well. Six to one, half a dozen to the other. Maybe I'll get to retire some day decades from now, and have time to re-shoot all these old reviews. Don't quote me on that one, though. If you plan on keeping the packaging, I'd leave the figures in. Sideshow did make it simple to remove the insert with the figure, by slipping it out the side. But the accessories are still blistered to the insert, making it tough to remove them without damage. Still, if your careful with a razor blade you can cut the bubbles of each of the accessories and still keep everything in fairly decent shape. The box also has 'updates' on each of the band members. Well written and in the vein of the film, the package adds to the attractiveness of these figures. Sideshow is doing a great job capturing likenesses in their 12" line. These figures are not quite as good as some of their other offerings, but they are still a good representation. Each looks like the original actor - Harry Shearer as Derek Smalls, Michael Mckean as David St. Hubbins, and Christopher Guest as Nigel Tufnel - but the sculpts aren't as dead on as the with something like the Karloff Frankenstein. Sideshow is beating all others in the 12" market right now, including Dragon, in terms of articulation. At least in terms of number of joints - there still are some quality issues. But with a ball jointed neck, ball jointed shoulders, cut biceps, double jointed elbows, cut jointed forearms, wrists, chest, waist, ball jointed hips, cut joint hips, double jointed knees, cut joint calves, and ankles, *whew*...these things have plenty of POA's. My only complaint is that the joints tend to be loose. These figures definitely need the small stands they come with to allow you to pose them in the types of stances you'd expect. 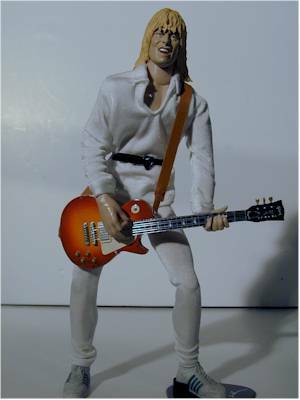 Each character comes with his trademark guitar, and these are of the same quality as the Resaurus Pickups. 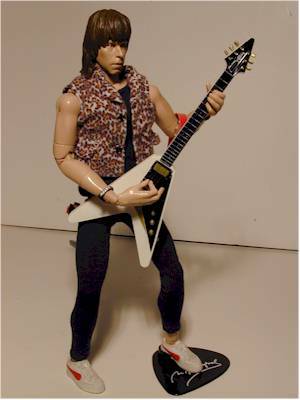 Right in 1/6th scale, with excellent details and sculpting, the guitars are superb. 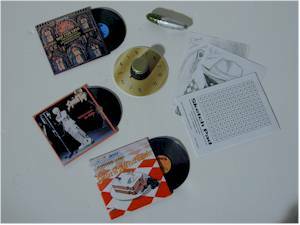 They also each come with a stand shaped like a guitar pick and emblazoned with their name, an album and album cover (made of cardboard), and one specific accessory. See the picture below for a better idea. Each of these three costumes is very nice. Perhaps the best touch is the shoes - if you're looking for 1/6th scale athletic shoes, then these are for you. They are perfect, and are made of a nice soft rubber that allows them to stand well, yet can be removed and put back on with ease. The stretch pants and outfits are great as well. The leopard print vest on Nigel fits great and is well designed. All the clothes fit well, and the quality is great, with one exception - the guitar straps. The three straps could certainly have been made of a better material, but they'll suffice. The real chains on Derek's hand cuffs are the type of detailing that Sideshow is becoming known for. At the original price of $30 a pop, these were a little steep. Not terrible, but $25 is a little more correct for the current 12" market. But on sale at seven bucks these guys are an absolute steal! If these hadn't been on clearance, I never would have picked them up. 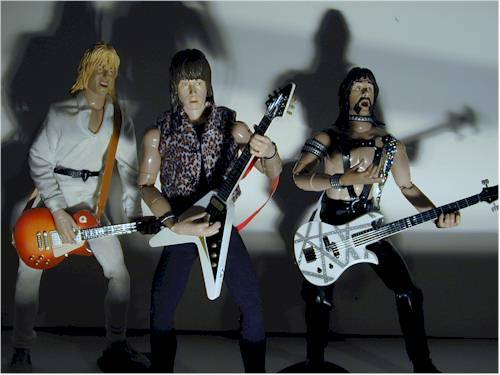 While I think the movie was terrific, I had no burning desire to own the plastic versions of the band members. But I'm happy to say that the quality of these is great, and further proves that Sideshow Toy is the company to watch in 2001. You probably won't find these for $7 each, but you can search ebay for a deal. 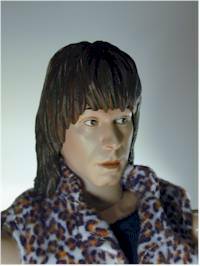 I've covered many other sixth scale figures in various licenses and style. You should hit the Search Reviews page to find them all and in case any other applicable reviews were done after this one was published.